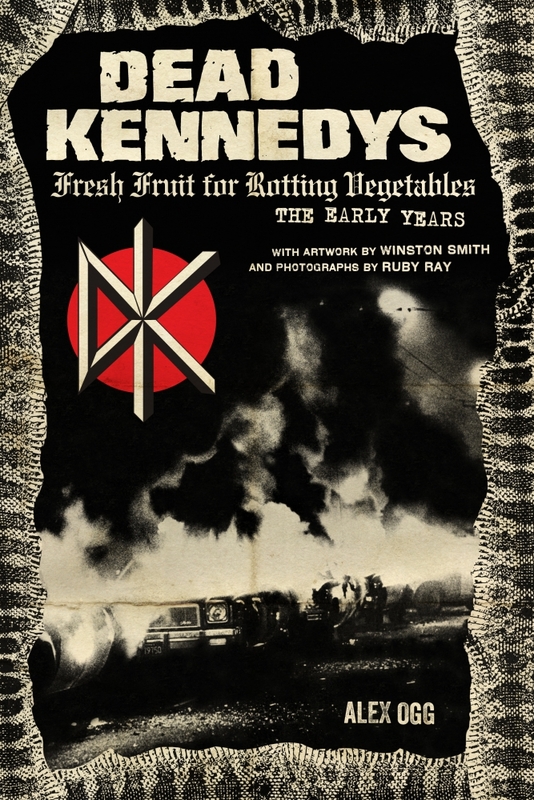 PM PRESS will present their new book, DEAD KENNEDYS Fresh Fruit for Rotting Vegetables, The Early Years, by Alex Ogg, with photographs by Ruby Ray and art by Winston Smith, with a book signing the night of the Reception. Photos and art from the book will be exhibited along with additional work from the era. The event PUNK: CONVULSIVE BEAUTY re-examines the explosive punk scene of 1977-1981 with the brilliant pairing of Ruby Ray and Winston Smith. This is Ruby’s first big show in SF since 5 years ago and you won’t want to miss it! She’ll exhibit a noir selection of over 40 photographs from her large collection of the mavericks who were a driving force in the early punk movement. 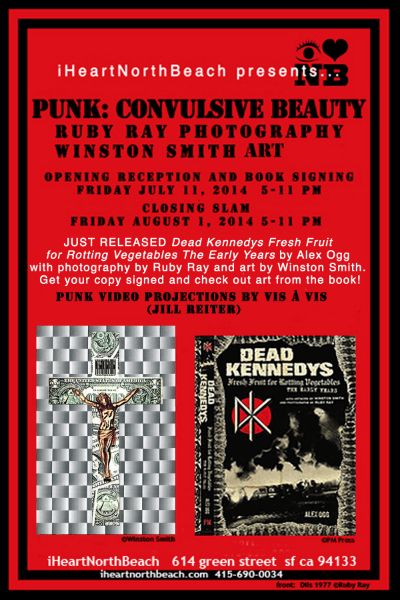 Winston Smith will be transforming the Icebox with early artworks and collage, including controversial images created for the Dead Kennedys’ record covers. Jill Reiter of Vis a Vis will be continuously screening overhead an old-school punk video projection. Libations will be on hand. This is a free event! Join up on Facebook. Check out the Brazil­ian promo to the book. Dead Kennedys rou­tinely top both critic and fan polls as the great­est punk band of their gen­er­a­tion. Their debut full-length, Fresh Fruit for Rot­ting Veg­eta­bles, in par­tic­u­lar, is reg­u­larly voted among the top albums in the genre. Fresh Fruit offered a per­fect hybrid of humor and polemic strapped to a musi­cal chas­sis that was as tetchy and inven­tive as Jello Biafra’s with­er­ing broad­sides. Those lyrics, cruel in their pre­ci­sion, were rev­e­la­tory. But it wouldn’t have worked if the under­ly­ing son­ics were not such an uproar­i­ous rush, the paraf­fin to Biafra’s naked flame. Dead Kennedys’ con­tin­u­ing influ­ence is an extra­or­di­nary achieve­ment for a band that had prac­ti­cally zero radio play and only released records on inde­pen­dent labels. They not only existed out­side of the main­stream but were, as V. Vale of Search and Destroy noted, the first band of their stature to turn on and attack the music indus­try itself. The DKs set so much in motion. They were inte­gral to the for­mu­la­tion of an alter­na­tive net­work that allowed bands on the first rung of the lad­der to tour out­side of their own back­yard. They were instru­men­tal in sup­port­ing the con­cept of all-ages shows and spurned the advances of cor­po­rate rock pro­mot­ers and indus­try lap­dogs. They legit­imized the notion of an Amer­i­can punk band tour­ing inter­na­tion­ally while dis­sem­i­nat­ing the true hor­ror of their native country’s for­eign poli­cies, effec­tively serv­ing as anti-ambassadors on their travels. The book uses dozens of first-hand inter­views, pho­tos, and orig­i­nal art­work to offer a new per­spec­tive on a group who would become mired in con­tro­versy almost from the get-go. It applauds the band’s key role in trans­form­ing punk rhetoric, both polem­i­cal and musi­cal, into some­thing gen­uinely threatening—and enor­mously funny. The author offers con­text in terms of both the global and local tra­jec­tory of punk and, while not flinch­ing from the wildly dif­fer­ing takes indi­vid­ual band mem­bers have on the evo­lu­tion of the band, attempts to be celebratory—if not uncritical. Buy the Book now from the publisher.